Above: Luke Watson has built a big-name client base from his Warragul home studio. Photo: William PJ Kulich. 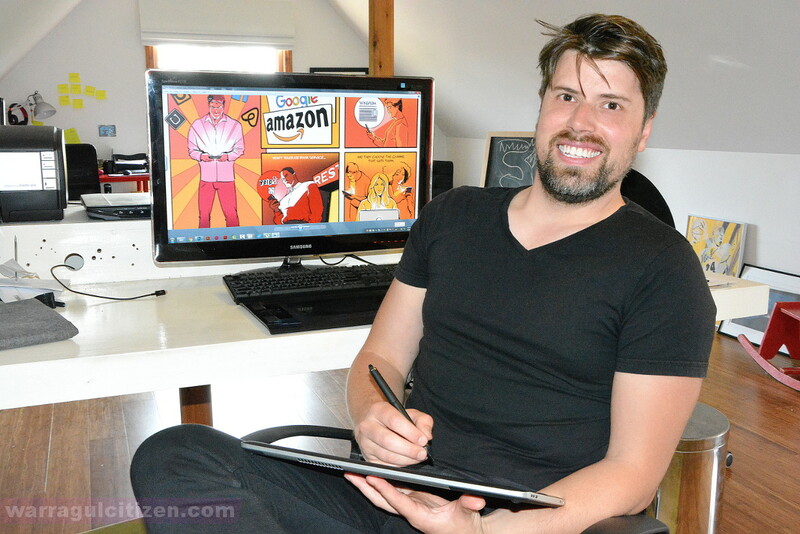 The Warragul freelancer has picked up big name clients and a number of awards with his bright, vibrant style. He has been nominated for a number of Stanley awards, taking home the “Artist on the Night” award in 2014, and also won the Michael Collins digital caricature award in 2009. The Warragul & Baw Baw Citizen caught up with Luke at his home studio to talk about his career. WBBC: You’ve been cartooning since you were young, I assume? Luke: Yeah, as long as I can remember, I was always the drawing kid. Professionally, I have been drawing since 2006. WBBC: Many good drawers never try to, or end up with, a career drawing. How did you manage? Luke: I was lucky enough to be in a situation where I could just blindly go into it without really considering repercussions. I took a ‘gap year’ sort of thing, so I was just on the dole, mucking around, and realised I wanted to draw and be a cartoonist and so I just started. My wife has always been really supportive so she said ‘yeah, we’ll get some flyers out’ and that sort of thing. I did a government-based course called NEIS, New Enterprise Incentive Scheme, which I’m not sure is still around, but it taught very basic business planning, you build a business case and they give you the dole, essentially, but you actually get supported. I did that for a year and thought ‘well if I can make as much as I make on the dole doing drawing, I’m in a good spot really.’ And then I did, and it built up and I never really gave myself a chance to stop. Having someone with a proper job, my wife has been a teacher in the past, that helps as you slowly build up. Luke: Well, that’s how people refer to it I guess. That’s a good point actually. I consider it my job, but I’m very lucky it doesn’t feel like a burden at all. Being a teacher is one of the most proper jobs you can get, if you want to define it that way. You’ll find a lot of cartoonists or creative people who have a significant other, the other person is something which is steadfast in the community and not going anywhere. WBBC: There aren’t many non-freelance cartoonists, how did you make that break when finding clients? Luke: You’ve got to give yourself time, and I was lucky enough to be in a position where I didn’t have any real bills to pay. You’ve just got to cast a wide net. Anything to do with drawing I tried. You pick up a good job, maybe once a year, and that person becomes a good client who you can continue with and other people see you have that client. It’s very much word of mouth, even with the internet. WBBC: Did drawing come naturally to you? Luke: I’m mostly self-taught. I did industrial design at uni, which is the most drawing-est degree I could find which wasn’t art. That was good. WBBC: Why were you after a degree which wasn’t art? Luke: I also love maths and engineering, architecture. This was a happy medium between art and engineering. My first job out of uni was as a designer for a property developer. WBBC: You’ve had some big clients. Who have been some of the stand-outs? Luke: I’ve had some pretty cool one-offs. I’ve done some book covers for Bloomsbury Publishing in the UK, they publish Harry Potter. It’s a good illustrative trophy to get, a book cover. I work with Microsoft Australia quite often. I help them demo new technology and show them how to draw stuff. WBBC: You’ve also had the chance to draw some celebrities – the other week you got to meet Mark Mothersbaugh from Devo! Luke: I do graphical recording, which is essentially captioning what people say on a day, and Mark was at the Screen Australia conference I was at. I just sit in on keynotes and draw stuff and take notes so they can take it away. They’re very visual people, and people who couldn’t sit in that session can try to catch up. Scod from Tripod was also there and at the end the guys from Tripod played [a locally produced show’s] theme tune and Mark was riffing on the guitar doing massive solos just off the cuff, and I thought ‘this is great!’ I do that every now and again, but primarily I work for big consulting companies like eXtensia and Deloitte; they’re not really ‘cool’ ones but they’re some of the biggest companies in the world. Businesses approach them if they need to change something within the business. If [they’re trying] to explain to someone how they’re going to change a whole system in a business, I draw a big picture explanation. I’ve been doing a lot of this sort of stuff and I’ve really enjoyed it, it’s a good fit between drawing, design and trying to understand really complex systems. I’m trying to convince all my colleagues this is where we should push, because [print media] is really struggling and we’re the first people to go, but consultancies are demanding us to come and help explain stuff. WBBC: You seem to have had a pretty smooth run to becoming a profession freelance cartoonist. What advice would you give to people trying to get into illustrating? Luke: You have to say yes. If someone asks you to do something, just say yes. It’s easier to learn how to do something than try to get clients around the things you already know. Last year I directed a film clip for a band just because I do some animation stuff; I got carried away, it was so hard, I didn’t know what I was doing, but it was good fun. I always say to people there are three important things: do what you say you’re going to do, do it on time, and do it on budget. In any business, if you do that, you’re going to be fine. You can find some of Luke’s work at his website, just click here.